Starting a new composition is difficult for me because there is no context. I do not yet know what is or is not meaningful. I have my guesses going in, my guide to an as yet unseen terrain and my game plan for approaching it. But like any other guide mine is a pale shadow that cannot simulate the encounter with a place, and like any other game plan mine too must adapt to reality. Or even be discarded. It is important to recognize when my preconceptions are wrong. “Man makes plans, God laughs.”  There are many artists and coaches alike who could stand to learn this lesson. My artworks’ beginning stages are marked by exploration. Investigative prodding at instruments, concepts, and sounds to find a way forward. Offensive coaches have scripts for the opening of a football game, a set sequence of plays meant to reveal a defense’s strategy. The information gleaned from this initial probing proves vital to subsequent maneuvers. Sometimes expectations are met and initial strategies hold. Other times these must be abandoned in search of new avenues. What holds and what goes is partly a product of circumstances beyond an individual’s control. One makes due with the situations they encounter through the tools they have to navigate through them. In this sense, the beginning of a new work is both my pregame preparation and so many iterations of an opening offensive series. Shots across the bow to provoke a reaction, or perhaps more accurately, a recurrent use of improvised defibrillators. I do not have film to study as athletes do so I instead must study myself, my past work and my present tendencies as seen through signs on a page, in an effort to discern paths towards a hazy goal. Success is less clearly defined than crossing into the end zone, but there is an internally audible sense of transversing a threshold that I only must take care to hear. The particulars of this journey ahead are often not mine to determine. They can be mere bounces of the ball, unfortunate realities and cold physics that I can only react to. They are improbable ricochets of a 50-50 ball off of Jermaine Kearse’s leg that fall into his lap, miraculous twists he did not earn but was adaptive enough to take advantage of. They are meetings of chance and virtuosity, from which artworks emerge. The artist like the athlete can be the victim of chance as well as its benefactor. In the above play, defender Malcolm Butler could not have been in better position, yet the outcome was still contrary to his desires. The lessons here are myriad, and it would be an injustice to compress them into digestible truisms. I rather wish to observe as an artist often victimized by my own equivalents of improbable Kearse catches, taking comfort in this reminder of the magic through which ways forward emerge. 1. Courtesy of Morton Feldman. Friedman, B.H., Give My Regards to Eighth Street: Collected Writings of Morton Feldman (Cambridge, 2000), 111. 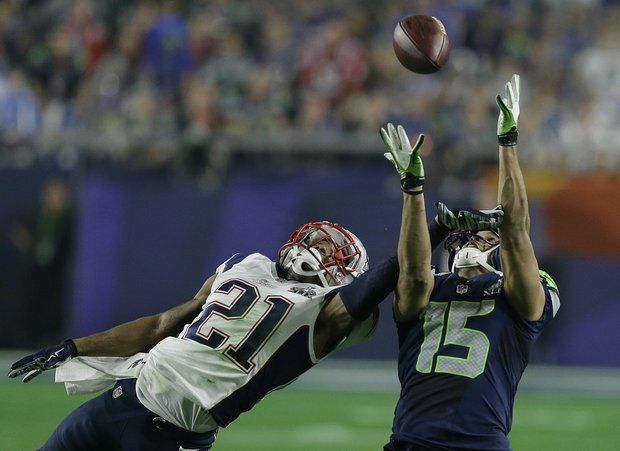 Robinson, C., “Before Malcolm Butler’s heroics, he looked to be victim of another great Super Bowl catch against the Patriots,” Yahoo Sports (February 1, 2015) http://sports.yahoo.com/news/before-malcolm-butler-s-heroics–he-looked-to-be-victim-of-another-great-super-bowl-catch-against-the-patriots–073140101.html (February 2, 2015).